When I look back at my Europe trip, I have so many moments and sights that stand out. So many things to write about – just looking back is a bit daunting. But I’m trying to organise everything and share useful information in nuggets, along with tips and travel information. Hopefully, over the next few months I’ll get to share some of it. In the meanwhile, enjoy this lovely view of Malaga with me. It was a cloudy day to start with. My host was quite disappointed by the weather I was getting to witness (it’s never like this, she kept telling me). But I set off anyway on a bit of sightseeing. I borrowed her son’s cycle and decided to explore the city on two wheels. At the end of my gallivanting, the skies cleared quite a bit and I decided to climb to the Castle of Gibralfaro. Even though I wasn’t optimistic about the views that day, I started off. It was a good decision. As the evening set in, suddenly I got a display of some brilliant colours – orange, purple, yellow – the sky was on fire! 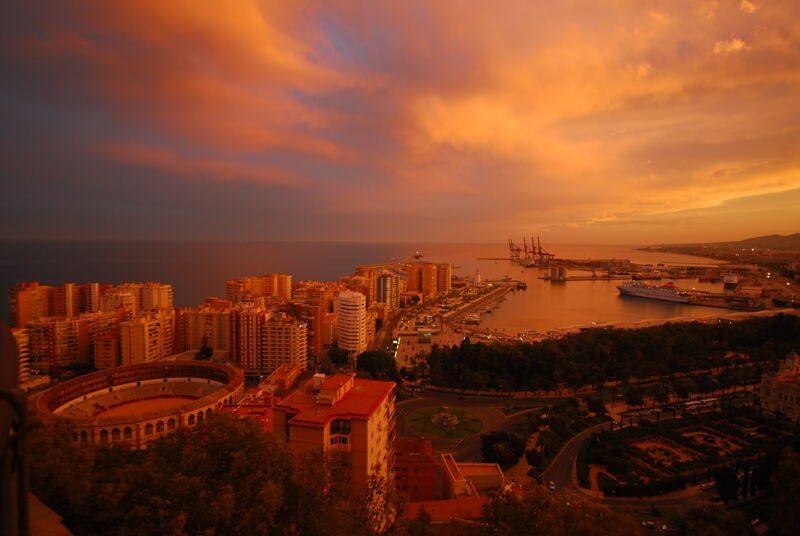 Malaga is on the southern tip of Spain, and apparently one of the oldest cities in the world. It also has some of the warmest summers in Europe. I spent quite a few happy days there and can recommend a visit to Malaga to anyone who is heading to that part of the world. It is also the place where I lost my passport, but I’ll reserve that story for another day. In the meanwhile, enjoy the view!